Key Difference: DDR 2 has clock rate of 200-533MHz, with transfer rates up to 1,066MTps, and a power consumption of to 1.8 volts. DDR3, of course, was an improvement over DDR2. It featured a clock rate of 400-1,066MHz, a maximum transfer rate of 2,133MTps, and power consumption of to 1.5 volts. So basically, it’s faster, stronger, better. 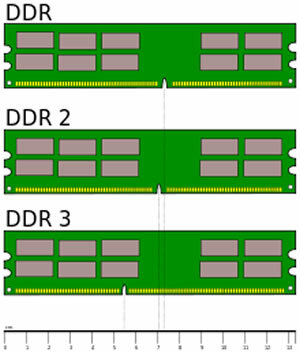 To understand the difference between DDR2 and DDR3 RAM, we must first look at and understand what is RAM and how it works. RAM stands for Random Access Memory. Basically, it is a type of short term memory where the operating system (OS), application programs and data is stored for faster access. The benefit of RAM is that it can be accessed much faster, as compared to the hard drive, which stores a lot of information. However, unlike the hard drive, the data stored in the RAM is temporary. It is only stored for the duration that the computer is running, which means that when the computer is shut down, the data is erased. When the computer is turned on again, the necessary files are copied into the RAM from the hard drive. Note, RAM is also the reason why the computer boots up faster from standby and hibernate, as the necessary files are already in the RAM and faster to access, rather than from shut down, where the files need to be accessed from the hard drive. So, DDR2 and DDR3 are two specific types of RAM. DDR stands for double data rate. The 2 and 3 refers the second generation and third generation. DDR is a type of RAM that was developed as an improvement to the regular SDR SDRAM, which was the previous standard. The DDR quickly became the industry standard as it allowed the memory transfer data on both the rising and falling edges of the clock signal; basically, because it was twice as fast. However, as computers improved, the demand on the RAM also increased. So DDR was followed by DDR2, which in turn was followed by DDR3, and then DDR4. 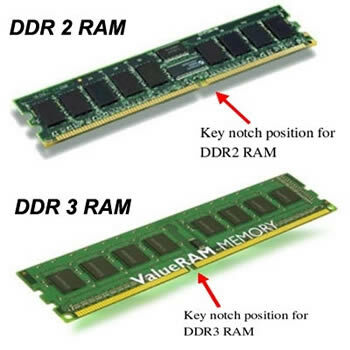 DDR3 is the current standard for system memory, aka RAM or, to get more specific, SDRAM. It replaced DDR2 as the standard and is currently being replaced by DDR4. DDR2 was an improvement on DDR. It provided a faster clock rate, which means that it transferred data at a much faster rate. It also had a higher maximum transfer rate, which means that transfer more within a specific time, all of that while consuming less power. DDR 2 has clock rate of 200-533MHz, with transfer rates up to 1,066MTps, and a power consumption of to 1.8 volts. DDR3, of course, was an improvement over DDR2. It featured a clock rate of 400-1,066MHz, a maximum transfer rate of 2,133MTps, and power consumption of to 1.5 volts. So basically, it’s faster, stronger, better. DDR2, DDR3, and DDR4 are not backward compatible, which means that they cannot be placed in each other’s port; a port will accept only one of the three types. The reason for this is the fact that each of them has different numbers of pins that connect them to the port and transfer data. DDR2 SO-DIMMs (small outline dual in-line memory module) have 200 pins, while the DDR3 SO-DIMMs have 204 pins. SO-DIMMs a smaller alternative to a DIMM and hence are commonly used in smaller machinery such as laptops and notebooks. The DDR2 DIMM (dual in-line memory module – the normal one we usually see) has a 240 pin module, and so does the DDR3. However they are still incompatible as they run on different voltages and their pins are in different places. The old standard for system memory, aka RAM. Was replaced by DDR3. The current standard for system memory, aka RAM. Soon to be replaced by DDR4. 240-pin module. SO-DIMMs have 200 pins. DIMMs have 240 pins, DDR3 SO-DIMMs have 204 pins.